Machara is an evil, untrustworthy fae of the worst sort. She sees plots in motion by saying something that sounds reasonable, only to twist the outcome into something else entirely, which may have something so obscure as to be laughable that supposedly fits the agreement that was made. Athdara strikes a bargain with Machara after she tries to make sure every loophole is covered, and she agrees to take Brachan, Machara’s son, to raise him as long as Machara restores her own son back to her perfect and whole as he was before with no memory of what Machara had done to him. Machara agrees. Laurel’s sister, Kate, present day, is recuperating after she and her cat survived a fire, she losing her right arm and her cat losing his left eye. Mirna comes to talk to her and sends her and her cat back in time to be with her sister, but not before sending her clues in a history book indicating that both sisters and her cat were indeed recorded as living in the 1600’s. Will Machara be defeated? According to the history book, she can only be defeated by women. Read the book to find out. The thing I didn’t like about the story was the inclusion of faeries and witchcraft. Another fun addition to this fun series! I Love the relationship/bond between Alasdair and Morna! Everyone needs an Alasdair in their corner!!! Morna has a person she wants to help so she worked for months writing down her life story of being mentored by another witch to learn how to be one herself. Her brother was supportive but her father did everything he could to thwart her learning. He even banished her teacher to shut down her learning. It worked for a few years but Morna finds her mentor's journals and starts reading and learning again. There are all kinds of family dynamics depicted in the story. Morna's father seems to be the worst kind of father to her, but then they have a conversation that seems to right all the wrongs of the past. Morna's brother Alasdair is the big brother who everyone needs in their corner. Awesome relationship there! Mary is the best kind of friend to have as well. Jerry offers the kind of love that satisfies the soul. There are problems that have to be faced and worked out, people who seem to be something they truly are not, and hidden agendas that have to be discovered, but it is a fun ride to the finish of the story. Well worth the read! The narrator did a great job of fleshing out the characters in the story. She was able to create that extra emotional imprint of the story with her voice, and accent. I chose to slow down her talking speed one step slower, though. Love is the most powerful kind of magic. Baodan McMillan values many things in life: friendship, loyalty, kindness, but certainly not love. After the tragic death of his wife many years ago, he hardened himself to the idea of giving his heart to another. There is only one lass who can thaw his chilly heart, a lass he's never met nor knows of, a lass whose birth won't occur until centuries after his death. Baodan comes across Mitsy when she arrives 'from the future' with enough strangely spoken futuristic jargon and a too spirited attitude for a lady of that day and time that Baodan believes that Mitsy may not have all her mental faculties nailed in place. And then there is all the havoc that is taking place in and around Baodan's life, home and extended family that keeps the pace of all the extenuating circumstances revved up to full throttle in a way that makes it seem that there is no hope for a positive outcome for all the troubles. But . . .
Baodan finally opens his eyes to allowing himself to take a less biased view of his circumstances and a more honest look at his feelings for Mitsy, and they do get to have their HEA!!! Was there any doubt?! 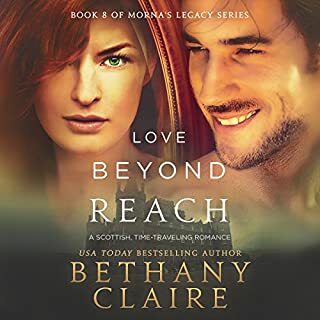 All the characters from the previous books of the series make appearances so you can catch glimpses of their ongoing lives and all of their own HEA's. This is a charming series of stories in the cozy setting of Scotland that simply warms the heart. It's Yuletide at Conall Castle. 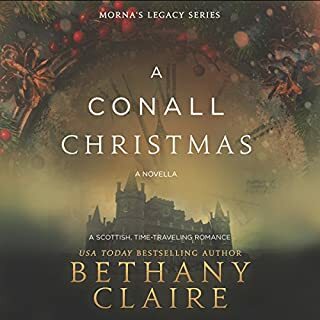 Christmas is quickly approaching, and Adelle is determined to make this Christmas the best one Conall Castle has ever seen, but loneliness haunts her. Love for her daughter sent her into the past, but she'd not expected the isolation she would feel. A former socialite and serial dater, she finds that her current age seems much older in the 17th century than it did in the 21st. She resigns herself to the fact that she will remain single for the rest of her days. It began nearly 400 years ago. The Conall clan and all their people were murdered in a surprise attack, their beloved castle and all evidence of who destroyed them burned to the ground with their bodies. In the centuries following, archaeologists searched through the ruins looking for any evidence of what or who had caused the untimely demise of such a powerful Scottish clan. All efforts were fruitless until a spell put in place by an ancient Conall ancestor finally began to work its magic. I loved hearing the accents and pronunciations of some of the difficult names. Lily Collingwood has a lovely reading voice and definitely adds life to hearing the story. Plus, the pleasure of being read to revokes the warm feelings from childhood when stories read aloud were so close to the heart. One thing I did, I increased the reading speed from 1xSpeed to 1.25xSpeed. In case you don't know what I am talking about, there's a symbol that looks like a speed dial in a car. Touch that symbol and it will give you many choices of speed for your personal preferences. I increased the speed because the lower speed wasn't fast enough to keep my mind from wandering. I think you will really enjoy this story AND the audible experience. It all started with a spell. Arran Conall lives with the consequences of his foolishness daily, his mistakes guiding him into darkness. 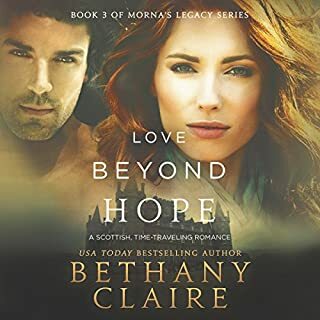 He had no way to know that his beloved would fall prey to the ancient magic that awaited Blaire on the day he sent her away to marry his brother. Now, the only woman to ever give pause to his philandering ways lives centuries ahead of him, out of reach while still holding on to his heart. 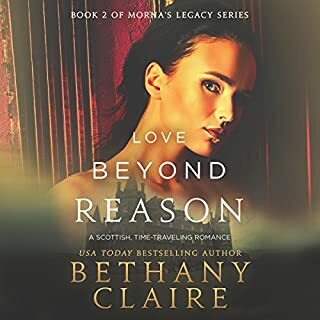 If you could sum up Love Beyond Reason: A Scottish, Time-Traveling Romance in three words, what would they be? 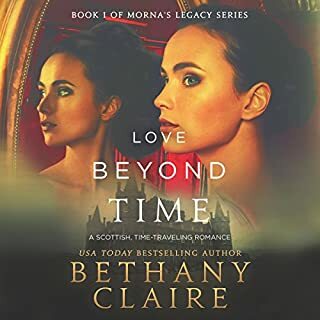 Scotland, true love and time-travel experiences. What does Lily Collingwood bring to the story that you wouldn’t experience if you just read the book? I love, love, love her Scottish accents that she applies to the characters voices!!! And she has a hypnotically soothing voice. The idea that a friendship is so strong that in the face of everyone insisting that Bri is quite alright and has sufficiently validated those facts, Mitzi is ready to sacrifice her job and also spends time and money that she doesn't really have enough of to determine for herself that her friend is truly unharmed in any way. That's a true friendship.